A six-storey hotel in north Devon badly damaged in a fire will have to be demolished, police have said. Twenty fire crews from across Devon and Somerset were called to help with the blaze which broke out at the derelict Montebello Hotel in Ilfracombe. Devon Fire and Rescue Fire Service said that there was some asbestos in the building in Fore Street which could delay the demolition process. Police said the cause of the fire was still not known. 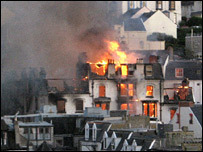 No-one was injured in the fire, but surrounding properties were evacuated after the fire broke out at about 1900 BST on Wednesday.